Regator has had its eyes on the social media and blogging trends space for the last three years, following the introduction of their blog search engine in 2008, expansion to mobile the following year, and expanding to display global trends just last year. A week ago, the company introduced a new application, reminiscent of TweetDeck and LazyScope, which they are targeting at newsrooms and bloggers who don't want to miss stories in their field as they break. The company believes that its ability to closely follow social media channels gives them the ability to deliver alerts to top stories long before they arrive on traditional sites, helping writers get their stories out ahead of competition. 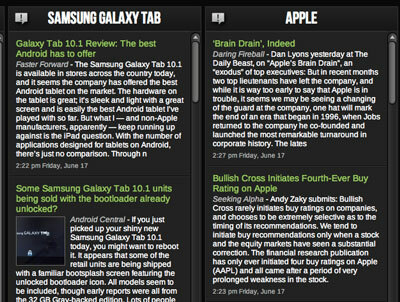 Meanwhile, if you're not shackled by the AOL Way or at a post mill like some of the major blogs, as a consumer, the new app can simply be a fun way to stay on top of the top news on topics you care about, cascading down your stream in a multi-column Adobe AIR app, with Growl alerts bringing new additions to your attention immediately. With TweetDeck nearly three years old, the environment of a chronologically-ordered multi-column AIR app is very familiar to most. 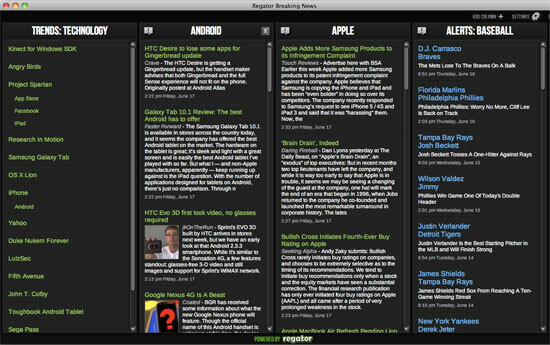 Regator mines its content repository, surfacing alerts from many different fields, including Entertainment, Sports, Politics, Fashion, Travel, Food, Tech and more, and more specifically, trending topics for all of the above, including subcategories like Social Media, Gadgets and Hardware for Tech, or Astronomy, Chemistry and Physics for Academia. You can also add columns for search terms of your choosing, and with the pro application, a Notes tab, intended for journalists sculpting stories discovered in the program. To get the best handle on the app, I'd recommend starting with top trends in a major area of your interest. 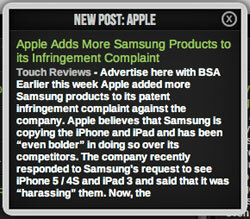 For example, my "Trends: Technology" column shows news of the day, from Research In Motion and LulzSec to more consistent updates from the world of iPhone, Android, Yahoo!, and yes, Angry Birds. Clicking any of these specific topics opens it up in a new column, so if you've got a beat that is interested in three or four major topics, you can just leave this app open and let the stories flow. In years past, I got excited about products like Lazyfeed, which did more than just follow individual blogs you had subscribed to or friends you followed, but topics you selected, and its partner, LazyScope, which combined quasi-RSS subscriptions to the Twitter experience. Regator has delivered an app that uses social as its content repository, but presents it in a way that is much more like a news wire than a social service. So you won't see which social media personality made a story popular, or any traditional social actions, like retweeting or favoriting. Just raw content with links to the source. It's a great way to get caught up on the news you like without having to suffer through all the topics you don't. A limited Web version of the service can be seen at http://breakingnews.regator.com/recent/, showing breaking news in the topics you select or more global content.You can also get the app on the site by going to https://breakingnews.regator.com/manage/ and clicking "Download Desktop App".